I originally wrote this reflection in 2005, but never published it for a variety of reasons. A recent resurgence in broad-brushed criticism of Internet forums, (such as this piece) not directed at our site in particular, but criticism which nevertheless could apply to it, prompted me to edit, update, and publish it for consideration in the debate. For twelve years now, I have had the pleasure of working with a great team of people to host the world’s largest English-language Orthodox Christian Discussion Forum, OrthodoxChristianity.net (often referred to coloquially as OC.net, located at http://www.orthodoxchristianity.net. It has truly been a blessing but it has also presented a challenge. It seemed to me that some might be curious about my experience running such a site, and would like to know what some of the perils are as well as some of the positives. I co-founded the site with my two friends Robert and Philip. Robert and I first conceived of running an Orthodox Christian message board in October of 2001. We weren’t Orthodox then, but were both excited about all that we were learning about the Orthodox faith and wanted to create a high-tech place for Orthodox to converge and share experiences. Robert was a technological whiz, and so we toyed with a few ideas. However, due to us both working full-time jobs, nothing much came of “Byzantines.org,” our first URL, until May 2002. That May, Robert and I were sitting in a car in the parking lot of Crabtree Mall in Raleigh, North Carolina. I looked at him and said, “You know, there are no modern Orthodox message boards out there.” There was a message board dedicated to all that follow the Eastern tradition, both Catholic and Orthodox, which was run by a Byzantine Catholic layman, but what of a board specifically for Orthodox concerns, using the newest technologies? Robert was excited about the idea and knew of some software. He also knew that Philip would be interested in being a part of the idea, so he chatted with him about it. Philip and I vaguely knew each other from another message board, the one mentioned above, and so I agreed and the three of us got to work. On May 12, 2002, “Byzantines.org” went online, and quickly attracted a moderate following. Some were refugees from the Byzantine Catholic site mentioned above, while others were friends of ours. Still others were entirely new. The start was slow, but we steadily increased. Robert had dreams of studying in Italy, and left in September 2002. The site went down for a month while I tried to find a host. Robert sent me a corrupted database by accident, so all of the old posts were lost. But on October 2, 2002, I set up the site on a new server, located at the new URL of http://www.orthodoxchristianity.net, which better expressed its Orthodox orientation. Robert returned unexpectedly from Italy and Phil and I were glad for that, as we had no idea how to run the software. We added for a time Nicholas as an administrator, and he helped us with our portal page and other matters. We had to let him go as an administrator when our personal differences became too great, but he remained a friend of us all and continued to post for some time. Throughout the years, we have continued to grow and add on new members. We currently have 8,907 registered members (not all of whom are active now, of course), who have written 1,191,840 posts in 54,761 topics. Each month, we get about 3 million hits, from all over the world. We are the largest Orthodox Christian forum in the world, and may be one of the largest Orthodox websites, period. As we grew, we added on a great team of administrators and moderators. I stepped back from active moderating, leaving the site in the hands first of Fr. Chris Harner, and later Fr. George Callos, who is at the helm presently. He oversees a team of about 15 moderators, who include both clergy and laity, from a variety of jurisdictions. It takes a lot of work for these folks to do what they do, and they do it as volunteers. 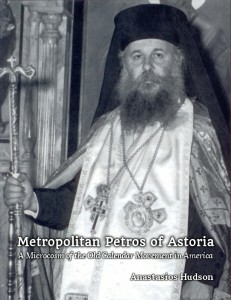 Thanks be to God, I have finally published my book, Metropolitan Petros of Astoria: A Microcosm of the Old Calendar Movement in America. This book, which was originally my Master's thesis at St. Vladimir's Seminary (2005), has been edited and corrected, and formatted for publication. "Metropolitan Petros of Astoria was born Stephanos Astyfides on September 1, 1915, on the island of Chios, Greece, to Maria and Dimitris Astyfides. From an early age, it is reported that both he and his brother Nikolaos (later Fr. Niphon) were inclined towards monasticism. At the age of 18, Stephanos set off with Nikolaos to Mount Athos, where they resided at the Skete of Saint Anna in the Cell of the Holy Ascension. They were ordained as deacons and priests by Bishop Germanos of the Cyclades in order to serve parishes in Thessalonica, Chios, and Athens that adhered to the Julian Calendar. The precise date of Father Petros's ordination to the priesthood was August 9, 1944. At this time, there were no bishops and very few priests affiliated with the Greek Old Calendarist Church, and as a result hieromonks from Mount Athos performed the task of serving for those faithful who refused to accept the New Calendar" (Chapter 2). Thank you for continuing to make OrthodoxChristianity.net the best and largest Orthodox Christian message board on the Internet! Continuing its long-standing tradition, OrthodoxChristianity.net has shut down its Orthodox Christian message board for the duration of Clean Monday. Clean Monday, the first day of Lent, is one of the strictest fast days of the year. Fasting is not just about giving up food, however; the Fathers of the Church also explain that we must fast from the passions. In this vein, the Administrators of OrthodoxChristianity.net wish to assist their fellow Christians by removing any temptations that might arise from posting online. Over the years, some have asked why the site is not shut down during the entirety of Lent. The reason is that the site is a large repository of information on the Orthodox faith, and a place where Orthodox Christians gather to fellowship, which are inherently positive things. The site does ask that participants review their total time spent on the site during fasts, however, and limit it accordingly. Welcome to OrthodoxChristianity.net, home of the world's largest Orthodox Christian message board/discussion forum! OrthodoxChristianity.net was founded on May 12, 2002, and has enjoyed a steady growth since then thanks to our readers and participants. Our goal is the propagation of the Orthodox Christian faith—the faith of Jesus Christ and His Apostles. Numerous people have been helped along on their journey towards becoming Orthodox due to our site, and we thank God for the opportunity to serve others in this capacity. In addition, our site provides fellowship for many people who live far from an Orthodox Christian parish. The forum is not the only feature of our site, though. We have several articles, photo galleries, and a growing Orthodox dictionary which will help to define all the terms that many find unfamiliar when encountering Orthodox reading for the first time. We are always looking to expand our offerings, and if you'd like to join our team of editors and writers, please contact me. Welcome again to the site, and please pray for us as we pray for all that they might find the fullness of faith, the New Testament Church, the Orthodox Church of Christ.